In an unusual experiment, scientists have used pond snails to study the effects of methamphetamine, better known as crystal meth, on the brain. They discovered that the drug enhanced the creatures' abilities to learn and remember a task. This gives insight into how some addictive drugs produce memories that are hard to forget, and that can even cause addicts to relapse. The scientists described the discovery in the Journal of Experimental Biology. Barbara Sorg from Washington State University in the US led the research team. She explained that the snails provided a "simple model" enabling scientsts to examine the effects of drugs on an individual brain cell. "These drugs of abuse produce very persistent memories," explained Dr Sorg. "It's a learning process - drug addiction is learning unwittingly. "All of these visual, environmental and odour cues are being paired with the drug. So addicts might be able to kick their habit in a treatment centre, but when they return to their old haunts, all those cues trigger craving and relapse." The ultimate question, said Dr Sorg, is why is it so hard to forget these memories? To take the first step in answering that question, she and her team examined the effects of crystal meth on the snails, by comparing the performance of drugged and "un-drugged" snails in a simple breathing task. 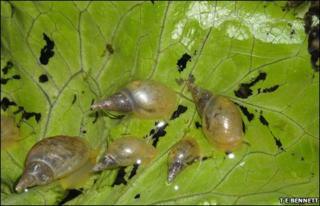 "The snails normally live in stagnant water and they breathe through their skin," explained Dr Sorg. "But when the water gets low in oxygen, they surface and open up a breathing tube. The scientists trained the snails not to surface by "poking" this breathing tube with a small stick. "They don't like that, said Dr Sorg, "so they learn through trial and error not to come up to the surface - they form a memory." The researchers found that if the snails were exposed to a low concentration of methamphetamine before the breathing task, this "primed them" to form a more persistent memory of it. The un-drugged snails would generally forget the task 24 hours after training. But methamphetamine-treated snails would retain the memory for longer. "The drug is not present in their system any longer, but something has happened in their cells that primes them for learning," said Dr Sorg. Having seen this drug-enhanced or "pathological" memory-making in action, the scientists now want to know what is changing within an individual brain cell. Dr Sorg's colleague, Professor Kenneth Lukowiak from the University of Calgary in Canada had previously identified the one critical cell, or neuron, in the brain of these snails that is crucial to learning and remembering how to regulate their breathing. This cell releases a signalling chemical called dopamine; a chemical that, in mammals, is involved in the brain circuitry associated with addiction. "That's why we decided [this snail] would be a good system to study," said Dr Sorg. "Now we want to look in that brain cell and find what has changed. It's a big task but some recent studies in our lab point to changes at the level of the cell's DNA that are caused by the drug." The researchers say that this work lays the foundations for ultimately targeting memory in the treatment of drug addiction and other disorders, such as post traumantic stress disorder. The ultimate idea would be to target specific memories - these pathological memories - to be forgotten or diminished. Dr Sorg concluded: "If we know something about how these memories are formed, and just as importantly, how they're forgotten, and if we can understand something about the process that promotes forgetting in a single cell, we might be able to translate that to higher animals, including humans." Professor George Kemenes from the University of Sussex, studies memory in molluscs in work that is funded by the UK's Medical Research Council. "Molecular level findings in snails can be highly instructive for learning and memory research in mammals, and can help us to understand how humans learn and remember," he said. "Ultimately, the humble snail could help prevent and treat memory disorders or even enhance normal memory." Hear more from the researchers on Science in Action on the BBC World Service on Friday 28 May.